Lungworms: (Dictyocaulus viviparus) . Stomach worms: Barberpole worms (Haemonchus contortus) , Brown stomach worms (Ostertagia ostertagi) , Small stomach worms (Trichostrongylus axei) . Intestinal worms: Hookworms (Bunostomum phlebotomum) , Thread-necked intestinal worms (Nematodirus helvetianus) , Small intestinal worms (Cooperia punctata & C. oncophora) , Bankrupt worms (Trichostrongylus colubriformis), Nodular worms (Oesophagostomum radiatum) . Treats 58 animals of 220 lbs each. Turn plunger rod so that notches face up and retract rod fully. Insert cartridge and ring into gun handle until flush with rubber gasket. Turn cartridge and ring clockwise to secure cartridge to gun. Push plunger rod forward until firm contact is made with cartridge plunger. Turn plunger rod so that notches face downward. Remove cap from cartridge. Depress trigger until paste has been ejected. Discard ejected paste. This is to ensure a full initial dose. One full depression of trigger delivers one dose for a 220 lb animal. Insert nozzle through the interdental space and deposit paste on back of the tongue by depressing the trigger for the appropriate number of depressions as determined from the table in the dosage section. 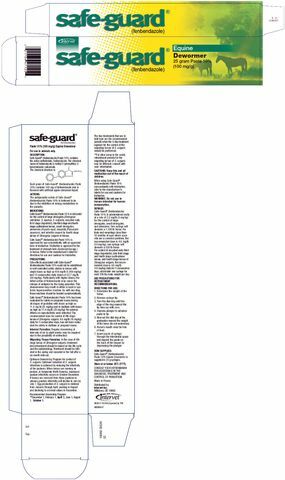 Safe-Guard ® (fenbendazole) Paste is given orally to beef and dairy cattle. 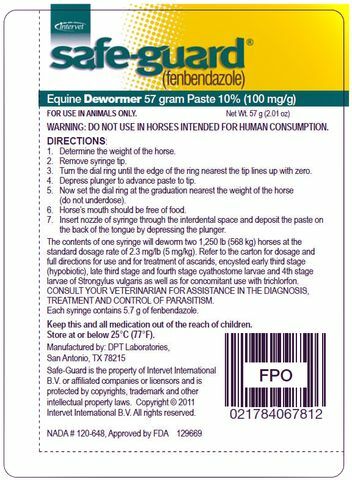 The dose is 5 mg fenbendazole/kg (2.3 mg/lb) of body weight or 5 g Safe-Guard ® (fenbendazole) Paste per 220 lb body weight (100 kg). 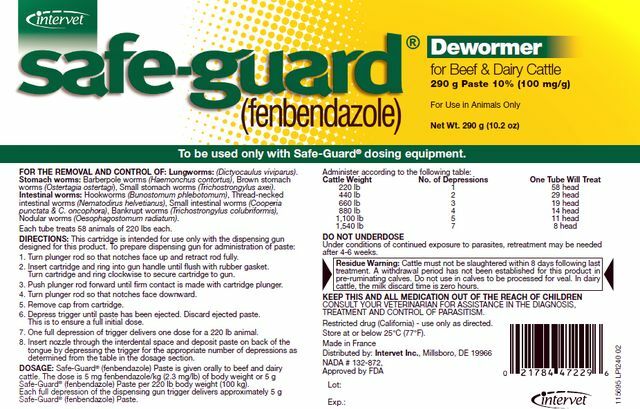 Each full depression of the dispensing gun trigger delivers approximately 5 g Safe-Guard ® (fenbendazole) Paste. Cattle must not be slaughtered within 8 days following last treatment. A withdrawal period has not been established for this product in pre-ruminating calves. Do not use in calves to be processed for veal. In dairy cattle, the milk discard time is zero hours. Store at or below 25 °C (77°F). Safe-Guard is the property of Intervet International B.V. or affiliated companies or licensors and is protected by copyrights, trademark and other intellectual property laws. One tube deworms 4 (1,000 lb) horses. To be used only with Safe-Guard ® dosing equipment.